The digital renderings of a new Chattanooga neighborhood are meant to give viewers a glimpse into the future, a future in this case that could be as soon as 20 or 25 years away. But the renderings are so good, they look like photographs, some of them street views and some of them overviews of a neighborhood taken from a helicopter. The renderings show a clean, mixed-use, tree-lined, artfully planned downtown neighborhood between Riverfront Parkway and the Tennessee River. Yes, there's that much room there, between West M.L. King Boulevard and 19th Street, 112 acres worth of prime real estate. The schematics are so inviting, you want to believe someone could create the whole neighborhood somewhere, pick it up and put it in the place of the acres of asphalt and some of yesterday's manufacturing buildings currently occupying the area. The neighborhood, once occupied by venerable Combustion Engineering (then by Alstom and then owned by General Electric Power), is the dream of real estate developer Jimmy White and hotelier Hiren Desai. The pair bought the property from GE Power in 2018 for $30 million, an absolute steal. When built out, White says, there could be $2 to $3 billion worth of investments in the neighborhood. But it's all on paper, online or in renderings now because he and Desai don't want it to be just their concept. They've already met with officials from the city, county, foundations, River City Company, Chattanooga Housing Authority and many other entities who might have a thought about what should be part of development in the area. On Thursday night, they entertained the public and solicited suggestions. "We do have a blank canvas," White told Times Free Press editors and writers earlier that day. What they envision, he said, is a neighborhood where you can "live here, work here and play here." It would be easy, he suggested, to re-sell individual pieces of the property and allow them to be developed without a thought to the entirety of the area. That's already being done nearby, he said. But he and Desai want something better, something developed in a newer, better and more integrated way. "If everything is gold-plated and expensive," said urban planner Victor Dover, whose South Florida-based Dover, Kohn & Partner drew up initial plans for the area, "we will have failed." The area's manufacturing past will not be forgotten in the future plans, either. Because what remains in the area are the Blue High Bay buildings, into which Alstom put $500 million earlier this century, including an $88 million vacuum-sealed chamber for testing turbines. The buildings, in pristine shape and sporting river and rail access among other amenities, are being offered for the right business. Even without the occupancy of those buildings, according to White, more people already are working in the former Alstom manufacturing site than were when the plant closed down. The initial plans, when built out, envision 1,066 residential units, 5,192 jobs, 488 hotel rooms and 1,500 to 2,000 trees. Just exactly how many people might live in the area was unclear. When begun, development would move from north to south, beginning adjacent to the Blue Goose Hollow Trailhead of the Tennessee Riverpark. Dover said the gradual development of the area would allow changes in the initial design to be made as it moved south. Throughout, plans call for single-family attached condominiums and townhomes, including "workforce[-rate] housing," walkable, car-optional streets, riverbank and other park areas, apartments (eventually), and even the re-creation of a canal running through much of the area, mimicking a creek that once crossed the expanse. Retail space, office space, and a food hall and associated music venue are among the other features envisioned. The question for White, Desai and their partners, for others already building hundreds of downtown and Southside apartments, and for those eyeing a similar walkable community development for the former U.S. Pipe and Wheland sites between South Broad Street and the river is what will the market bear? The development and occupancy of all those sites will require a city continually adding new, good jobs, a part of the population preferring to leave the suburbs and come downtown, and a downtown constantly evaluating how it can be better, safer and more accessible. What White and company have rolled out is, frankly, amazing to envision — that the onetime manufacturing heartbeat of the city could be transformed into an inviting, green, vibrant neighborhood adjacent to downtown. On the other hand, only 50 years ago, Chattanooga was labeled in a Federal Air Quality Report as the most polluted city in the United States. Today, no one would guess that. 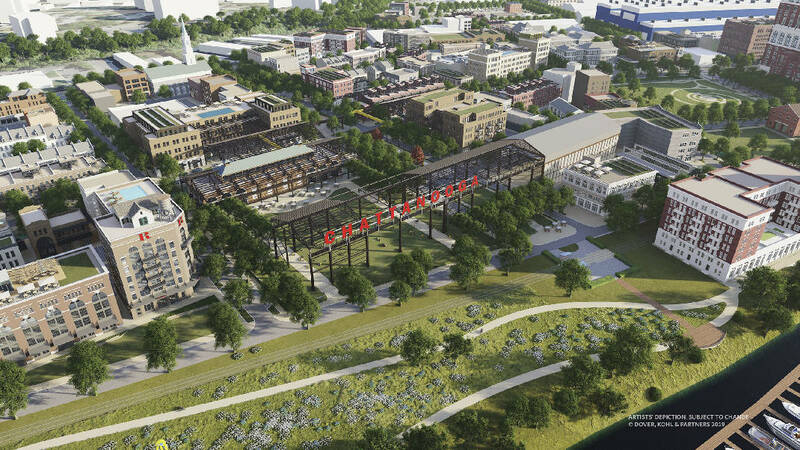 We look forward to seeing the vision at the Scenic City's front door come to life.